But these days, it seems nobody really knows what to do with those mini-cards. They were the rage in the early 2000s, but a difficult-to-file anomaly now. And although I really like the clever overlapping design of email, Twitter, and website, that’s not really the email address nor website that I prefer. Here, Netninja.com, is my home. I figured it was time to redesign my calling card. Something I find extremely valuable in a business card is the ability to write a quick note on the back. Maybe a new friend wants to jot down where they met you or the topic of your conversation. Or maybe you want to write down a phone number or a time and location. The mini Moo cards don’t work super-great at this, unless you have a Space Pen or permanent marker. 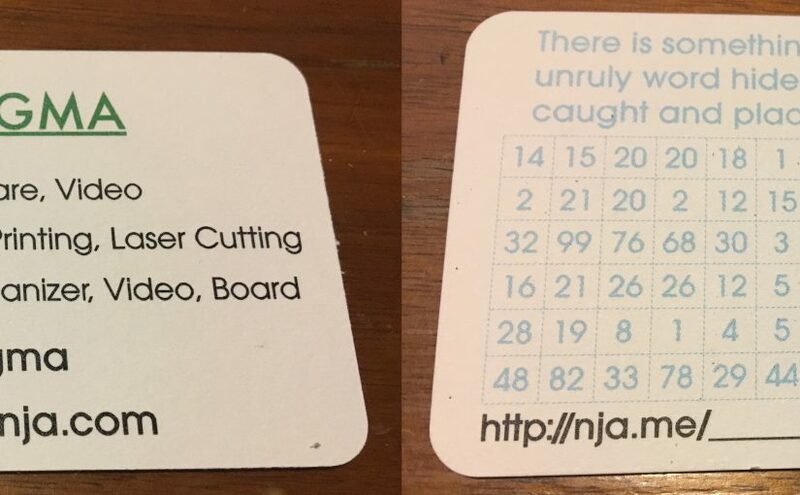 Full-size business card, not the half-height mini-cards. Plain paper back so that you can write notes. Contact info and user icon on the front. 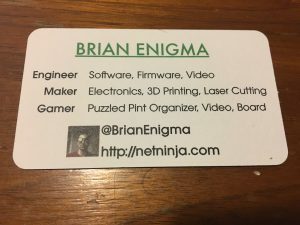 Some “titles” or other info about my profession and hobbies. Perhaps incorporate a puzzle or some other clever design element such as papercraft? The new cards have a straightforward front. I have a minor worry that the text might be a bit busy. On the other hand, I tend to be a shy introvert and may use that as a conversational crutch. The fun part is the reverse. It features a puzzle that, while it takes up the whole face, is drawn in the same color cyan as graph paper. It should visually get out of the way if you need to scribble over part of. The puzzle itself is fairly simple, with the intended audience being puzzling-newbies. It’s designed to give a little taste of what Puzzled Pint puzzles are like. Feel free to give it a try yourself, though it’s easiest to solve when printed out. Hints — actually a whole walkthrough — are available by plugging the word hint into that URL shortener.